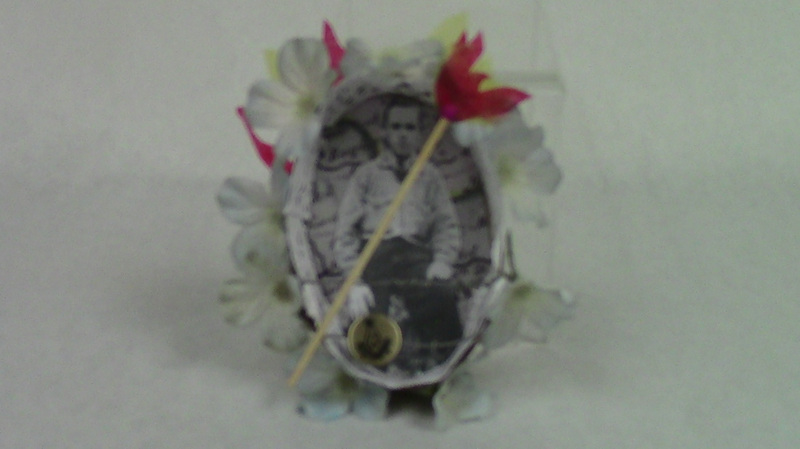 This shadow box is dedicated to William Lowenberg. The background of the box depicts a map of Borculo, Holland, a place where he and his family moved to when he was young due to anti semitism in Germany. The wire wrapped around the box makes it look like barbed wire. This shows that he was trapped for so long in multiple different concentration camps. On the top of the box, There are some flames and a burning match stick. William was forced to burn buildings during the Warsaw Uprising while searching for valuables for the Germans. “You’ve turned fifteen, so you’re now going to get on the next transport to Auschwitz.” William Lowenberg stared longingly at his family, reluctant to leave them after living so long together at Westerbork. His mother wrapped an extra coat around him to keep him warm for the rest of his journey. William squished inside a cattle train full of eighty-some people, with no food or water. His five day journey seemed never-ending, but eventually the train pulled up to a place called Auschwitz. The boxcar doors flew open as officers ordered the transportees to line up. Dr. Mengele came around with his riding crop and stopped by William. The words just flew out of his mouth without any control. It was as if God responded for William. Dr. Mengele pointed William to the right. How lucky he was that God answered for him, because the people on the trucks were sent to the gas chambers. Entering the camp, William’s head was shaved, and he was given a pair of striped pajamas. He was stripped of all of his belongings, including his name. He was now known as 145382. It was 1942, fifteen years after William was born in the small town of Ochtrup. It was only six years after William and his family fled to Holland to escape anti-Semitism in Germany. But even in Holland they weren’t safe. His whole family was sent to the Westerbork concentration camp. Then William was sent to Auschwitz alone. The conditions were horrible; the meals were meager, and they only ate about 200 calories a day. They got a piece of bread at night, and in the morning they got “tea” which was just hot colored water. For lunch, William would have to share one bowl of soup with four others. William was then moved to the Warsaw ghetto where he was forced to work for the Germans. He entered the ghetto during the uprising, where he saw Germans who burned buildings and destroyed almost everything, searching for valuables from the Jews. William took part in the uprising, which was a tough time for him. In Warsaw, he couldn’t get over having to burn bodies. He was forced to try destroy the whole ghetto. Although he was forced to scavenge for valuables for the Germans, valuables weren’t much to William. You can’t eat diamonds. Then came the marching. Lined up with 3000 other prisoners, William began to march from Warsaw to Dachau. They marched for a week with no food or water, until they came across a river. The hot July sun beat down on them, making them sweaty and dehydrated. William ran into the river with the others and started drinking. But for some people, the drinking wouldn’t stop, and the SS had to get involved. The Germans and their dogs lined up on the other side of the river. They started shooting at the people in the river. William got out quickly enough, but other people continued drinking despite the gunshots raining down on them. The murky river slowly turned red. When William reached Dachau, he was sent to Kaufering Camp. There were no gas chambers in Kaufering, so they would die of beatings or starvation. William was sent there to work for the war industry. One night, the Americans opened the gates of the camp. They proceeded to liberate the prisoners, when they realized that typhoid was going around in the camp. Typhoid is a disease that the prisoners caught from food and water, and since there was no good medicine, the disease spread more and more. They had to close up the camp again, in order for the American soldiers to not get infected. It was the spring of 1945, when the American Army burst through the camp and liberated everyone. William was elated after being worked and worked almost to death. After not having enough food or water, William and the other prisoners scavenged Germany, searching for anything they got their hands on. The American soldiers were very good to William, and changed his outlook on life. The first thing that William did when he was liberated was search for his parents and sister. He thought that maybe, maybe there would be some hope, even though he saw his own family enter the gas chambers. That false hope he had was one of the only things that kept William going during those times. After being liberated, William moved to the United States with only ten dollars in his pocket. When he arrived in America, William felt that he owed the Army a favor for liberating him. He enrolled to fight in the Korean War for three years. After the war, he came back to America with no money or home. He had nothing. But with the ten dollars he had in his pocket when he first came to America, he was able to succeed. Using those ten dollars, he created a successful real estate business. William has contributed to the United States Holocaust Memorial Museum and has spoken at many places, sharing his story with others. His story has impacted me, and will hopefully impact and influence others as well.